This is the second part of a two part blogpost about books directly focused on Marketing for fast growth oriented startups. My most recent post reviewed the superb ‘Traction: A Startup Guide to Getting Customers’ by Gabrial Weinberg and Justin Mares, 2014 and this post will review Startup Growth Engines: Case Studies on How Today’s Most Successful Startups Unlock Extraordinary Growth, Kindle Edition, June 2014 by Sean Ellis, Morgan Brown & the GrowthHackers.com team. 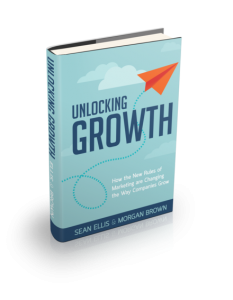 The introduction to this new book explains that the case studies are part of the research effort that comprises the strategies and tactics for how to unlock growth for new companies and products in the uncoming book ‘Unlocking Growth: How the New Rules of Marketing are Changing how Companies Grow which will be a detailed look at what it takes to grow your business outside of the traditional marketing playbook. In 2010, I coined the term ‘growth hacker’ to define a new type of marketer leading a new type of growth-oriented marketing organisation for startups. After five years working with some of the fastest growing companies on the Web – such as Dropbox, Eventbrite and Lookout – it was clear that the most successful companies today are ones who are able to effectively scale their user base, revenue and ultimately value in a way that is fundamentally different from their competitors and that creates outsized audiences and value in the process. Each section of the book represents a case study on a different product and their approach to growth: what helped the business gain early traction, and what is fueling the business today. The list of 10 case studies are all well known: Yelp; GitHub; Upworthy; Hubspot; Evernote; Snapchat; Uber; Belly; Square; and LinkedIn. So the book is not necessarily about Marketing per se but marketing is at its core as it addresses growth strategies. It is a fascinating read – a fair criticism of the book is that the authors draw their own conclusions and interpretations from the case studies in a somewhat speculative fashion. But doesn’t every book do that – either a rosy picture is painted or hindsight is used to explain what happened when at the time, the future was unpredictable. As such I think the case studies are hugely valuable for anyone looking at growth strategies as they are thought provoking. I particularly liked the LinkedIn case study which launched in 2003 and has evolved immensely in 12 years. ► The first and most critical element is that they all have a highly valuable product that has become essential in their customer’s lives. ► Each of these companies have a deep understanding of their customer and a rigorous analytical approach to growth that enables them to be hyper-efficient in acquiring, retaining and monetizing their customers. These insights yield unique customer acquisition strategies that highlight this new approach to thinking about growth. ►These companies make growth a priority across the company – it’s part of who they are. Growth is not just a concern of sales and marketing, but of product, engineering and support too. ► In these growth-oriented companies, the new marketers (the growth hackers I called for nearly four years ago) are leading cross functional teams, are steeped in data and creativity, scientific thinking, and are immersed in the product as much as the promotion. 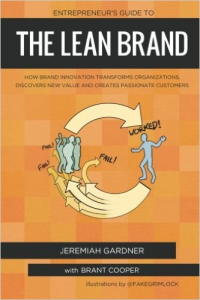 From Brant Cooper, one of the authors of The Enterpreneur’s Guide to Customer Development, I have downloaded ‘Chapter 3: Brand, Meet Lean’ of this book for free from LeanBrandBook.com – and added the book to my wishlist. #.6 Book & eBook ‘Don’t Just Roll the Dice: a usefully short guide to software pricing’ by Neil Davidson. Link to download free pdf. Finally: what books do you recommend? I often say that I like books that say what I already agree with. I also like books that are well structured; use models and/or detail steps; and give practical examples such that I can recommend the book for further reading during training workshops. The books in this post meet these criteria. I would love to hear about the startup marketing books that you would recommend. Some time ago I created a Slideshare presented (see below) entitled ‘Startup Marketing in a Nutshell – The Why What How and When’. Slide 26 of 32 outlines a generic marketing roadmap for a startup as it develops from pre-startup to the growth or established phase.The slides also refer to a blogpost which provides a format for a One Page Marketing Plan – and a link to download a template in pdf. The Traction Book plus the Case Studies in Startup Growth Engines provide great depth on which growth hacking actions to embrace as you grow your startup. Do you agree? or has your experience differed. Love to hear your comments. As always, I hope you enjoyed this post. Comments welcome.